Creek's background is in affordable hi-fi separates, being at one time the brand that you bought if you couldn't afford to buy Naim product. Founder and chief designer Mike Creek has never deserted that market, but in 2005 he announced a new approach with the Destiny range, something much more deluxe and upmarket than previous Creek products. 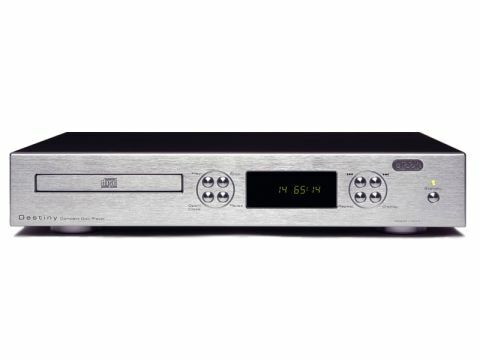 The Destiny CD player was the first model to hit the market and it has found consistent favour. But how does it stack up against the five promising rivals? Well, for starters, the thick aluminium front panel and immaculately assembled case make a good impression, as do the high-quality audio sockets at the rear. The front panel is better equipped than many, with unique buttons for pause and play, for instance, making operation more straightforward than when both functions share a button. The display is a pleasant shade of turquoise and can be dimmed or switched off. Creek has kept things simple, with no upsampling apart from that carried out in the course of normal digital filtering. The chip is a Cirrus (Crystal) component, not quite the latest thing but still with a more than competent technical specification. It is followed by a minimum of analogue circuity, just a single op-amp per channel, which handles the small amount of analogue filtering and output buffering all in one go. The quality of all audio components is very good and Creek has taken particular care with the power supply, which has no less than three toroidal transformers, one each of analogue, digital and control functions. The transport loads discs quite quickly and makes next to no mechanical noise. It seems clear from our listeners' notes that its performance is characterised principally by a lack of character. To put it another way, it doesn't impose itself on the music or try to add any kind of spin, colour or other artefact. In a sense, no more needs to be said: surely any hi-fi component that achieves that aim is an automatic recommendation? Not necessarily, though, for all our listeners. One of the interesting things that often arises in our blind listening sessions is the discovery that the nearest approach to neutrality isn't always the one that gives the most pleasure. We can say with some confidence, that the player is neutral because we've correlated the recordings and other equipment used to review it across huge amounts of kit and because we have the lab results to back up our ears. But to the casual listener this is neither so obvious nor really relevant. What matters is the impression the player makes alongside its peers and while it's highly unlikely that such a neutral machine as this will ever actually make a bad impression, it might not be the most striking one. In fact, one of our listeners had nothing but praise for the Destiny, finding its sound: detailed, spacious, dynamic, well-balanced and pretty much everything one looks for. Another, however, generally enjoyed it, but would have liked just a little more energy, life and kick – particularly in the bass. For him, its sound was slightly tame and lacked some of the spark that a couple of the other players provided. All the same, it's impossible to deny that detail from this player is really first-rate and there is loads to enjoy at every level, from the most casual listen to in-depth aural analysis of familiar discs. Bass weight, treble sweetness and midrange neutrality are all admirable and images are precise and rock-steady. A fine piece of kit all round.